No one likes pain, especially chronic pain. However, there are certain types of pain that can be far more debilitating and even crippling than others. For example, a minor yet chronic back or neck pain may be bothersome but for most of us, we can continue in our daily activities. Yet a chronic pain in your hand can be a problem. But perhaps one of the most common and crippling types of pain is foot pain. Not only can foot pain restrict your activities, but it can also affect your mood, increase your risk of falls, and diminish your quality of life. If you are suffering from chronic foot pain, you’re not alone. An article from the Journal of Foot and Ankle Research reports that foot pain afflicts anywhere from 17 to 42 percent of adults at any given time. Among these sufferers, the most common sites of pain consist of the arch area of the foot, the big toe, and the bone just behind it – the sesamoid – and the bottom of the heel. 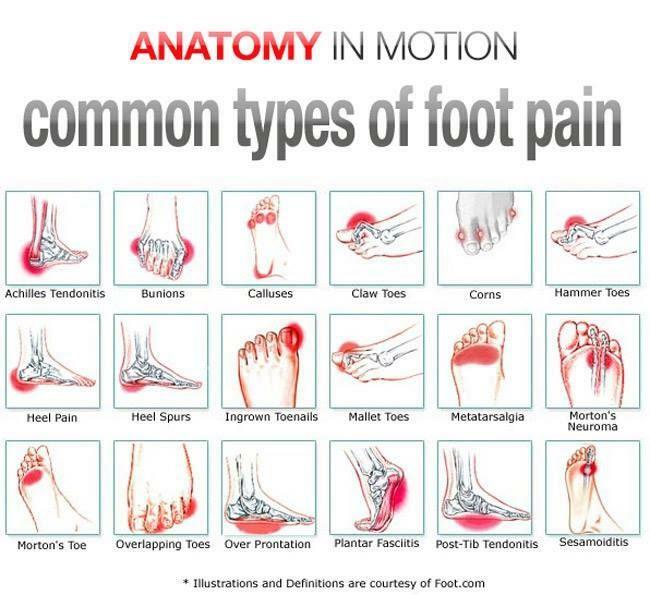 There are literally dozens of conditions that can cause foot pain. Some are relatively mild and temporary, such as blisters or ingrown toenails. Others are much more uncommon, a fractured bone in your foot, for example. But there is a relatively short list of very common causes of foot pain. Perhaps one of the most common – and painful – an affliction of the foot is plantar fasciitis. For most people, the pain typically decreases as they walk around during the day but tends to come back after long periods of standing or getting up from sitting. While it is common for runners to develop plantar fasciitis, so are overweight or obese people and those who have inadequate shoe support. While these are the more common causes related to plantar fasciitis, sometimes it is caused by abnormal biomechanics in the joints of the foot, knee and or hip. An unusual, or dysfunctional, joint motion in one or more of these areas can affect your walking gait. This, in turn, can increase stress on the soft tissues of the plantar surface leading to plantar fasciitis. Effectively treating plantar fasciitis begins with a comprehensive analysis of the position of the foot bones. This allows us to develop a therapy plan for correcting their position. In addition, we work on strengthening misfunctioning and atrophied muscles. Using manual therapy combined with a corrective exercise plan can restore normal foot mechanics and help prevent the plantar fascia from experiencing further excess force and stress. Active Release Techniques®, or ART®, therapy has been an effective tool for patients recovering from plantar fasciitis. If you are experiencing chronic foot pain, it’s important to see our health provider for an evaluation. This is the first step to feeling well and getting back to your usual activities. With proper diagnosis and an effective therapy plan, you’ll be able to do just that! When you come to your first appointment, we want to learn about your present discomfort as well as any history of discomfort. Treating and relieving foot pain starts once we understand where and how your pain started.